I remember when my son was about 2 years old he developed a very minor case of acute otitis media. I took him to his doctor who recommended and subsequently prescribed a course of antibiotics. I asked a couple questions but I really didn’t push her on my reluctance to go along with her recommendation for antibiotics. I left the office visit nodding that I’d give the antibiotics to him, but when I got to the car I placed the prescription in my glove box, where I’m pretty sure it sits a year and a half later. I’m still struck to this day on my apparent unwillingness to voice my disagreement with this physician’s recommendation. She is someone who I very much respect and trust, and maybe that is why I failed to openly disagree with her. However, there must be more than this, as I’m more than willing to give my opinion to my colleagues at work whom I also respect and trust. What the heck happened here? One interesting line of evidence of what may be occurring here comes from a research letter published this week in the Archives of Internal Medicine titled Communicating With Physicians About Medical Decisions: A Reluctance to Disagree. The authors of the study conducted an online survey of 1340 patients who were over 40 years old and who had visited a physician within the last year. They had them answer questions based on a hypothetical scenario about treatment of heart disease. The main outcomes looked at answers to three behaviors key to shared decision making: (1) asking questions, (2) discussing preferences, and (3) voicing disagreement, when relevant. Similar to previous studies, there was a spectrum of preferences in how patients wanted to make health care decisions. 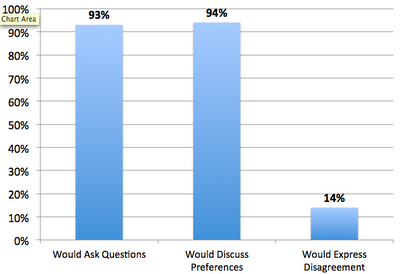 The majority, 70% preferred shared decision-making with their physician. Only a minority (11%) wanting to be mostly responsible for treatment decision making, and the rest (19%) felt that the physician should be mostly responsible. Despite being a highly educated group, and despite that nearly all patients could envision asking questions (93.1%) and discussing preferences (94.0%) with physicians, the vast majority would not voice disagreement with their physician if their preferences conflicted with physician recommendations (86%). For me, I think I just didn't want to be the difficult patient (or at least the pain in the neck doctor dad who thinks he knows everything). The real problem here is that the physician taking care of my son never actually knew that I wasn't going to follow her recommendations. My apparent assent to her recommendation had no relation to my adherence to her recommendation. I do think though, if I was just asked one question - "Do you have any concerns about the antibiotics" - I would have been honest with her about how I felt. I had the same thing happen to me, but with a CAT scan for my 6 year old - as we were in the office waiting for it, I googled what the raditation and effects are, and was horrified. I was very reluctant to say no, but I finally did, and it worked out fine in the end, but it was very difficult to do. I've been there too, though in my case, I actually (humorously, I hope) voiced my disagreement and then in the end did what the MD recommended, mostly because her also humorous response was to point out that I would be "ruining her HEDIS/quality scores" if I failed to get the (not entirely evidence-based) preventive service she recommended. This is an important problem for all of us to grapple with--especially since this could have future downstream unintended consquences. For example, the pediatrician could say, "well the child tolerated that [antibiotic] in the past so I will feel safe about prescribing it again in the future." In addition, since most of the people in the referenced study were between 40-60, I wonder if this is an even larger issue for people in their 80's, 90's and beyond, who may have additional generational issues about disagreeing with the doctor. In our practice, we require that physicians 'check a box' on the h/p form that states the "the patient has been educated and agrees to the plan documented above." This was done because of regulatory requirements that we document patient education and involvement in his/her plan of care. However, I often wonder what it means to obtain "agreement". We all know that silence does not equal consent, but I think we all secretly hope that it does. Perhaps in addition to teach back, I should be asking patients what their concerns are about what we planned/discussed today.